An iconic map of Shanghai, China, featuring a dramatic panoramic photograph of the Bund. Saishin Shanhai chizu. Ōsaka Asahi Shinbunsha tokusen. / 大阪朝日新聞社特撰 . 最新上海地圖. / Osaka Asahi Shimbun Special Selection. Newest Map of Shanghai. This is a rare and beautiful Showa 7 or 1932 map of Shanghai, China. This map was issued by the Japanese daily, Osaka Asahi Shimbun, to illustrate events associated with the 'January 28 Incident' or 'Shanghai Incident' (January 28 – March 3, 1932), a conflict between the Republic of China and the Empire of Japan that is considered a precursor to the Second Sino-Japanese War (1937 – 1945) and World War II (1939-1945). 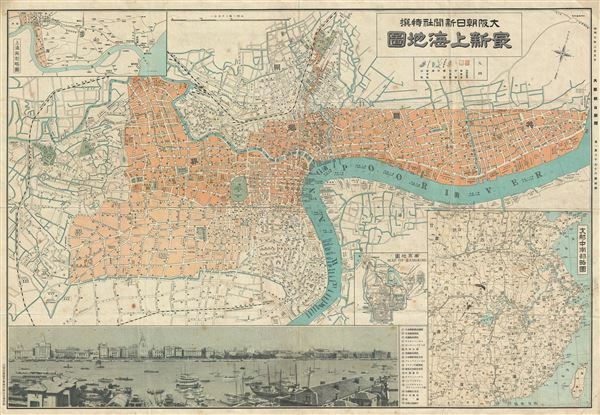 Printed in the 7th year of Hirohito's reign (Showa 7), it depicts downtown Shanghai including the Chinese Quarter, the French Concession, the English Quarter (along the Bund), etc. Important buildings along the Bund are carefully noted, including the first HSBC Bank, the British Club, the Palace Hotel (Swatch Art Peace Hotel), Sassoon House (Fairmont Peace Hotel), and the Customs House. There is also a lovely vintage panoramic photo of the Bund along the bottom of the map. The Bund is a waterfront area in central Shanghai. The area centers on the section of Zhongshan Road within the former Shanghai International Settlement, which runs along the western bank of the Huangpu River, facing Pudong, in the eastern part of Huangpu District. The Bund usually refers to the buildings and wharves on this section of the road, as well as some adjacent area. It is one of the most famous tourist destinations in Shanghai and building heights are restricted in this area. The Shanghai Bund has dozens of historic buildings lining the Huangpu River that once housed numerous banks and trading housing from the United Kingdom, France, United States, Italy, Russia, Germany, Japan, Netherlands and Belgium, as well as the consulates of Russia and Britain, a newspaper, the Shanghai Club, and the Masonic Club. The Bund lies north of the old walled city of Shanghai. This was initially a British settlement. A building boom at the end of the 19th century and the beginning of the 20th century led to the Bund becoming a major financial hub of East Asia. The former French Bund, east of the walled city, was then more a working harbor. A small inset map of Nanjing or Nanking is also included in the lower right quadrant of the map. Another larger inset shows a regional map. Most of the text is written in both Japanese and English. This map was issued by the Osaka Asahi Shimbun as a supplement to the March 5, 1932 issue. The Asahi Shimbun (January 25, 1879 – Present) or 朝日新聞, literally Morning Sun Newspaper, is one of Japan's oldest and most venerable daily newspapers. The Asahi Shimbun began publication in Osaka on January 25, 1879 as a small-print, four-page illustrated paper. The paper was founded by Kimura Noboru (company president), Murayama Ryōhei (owner), and Tsuda Tei (managing editor). In 1888 the newspaper expanded with a branch in Tokyo and began issuing the Tokyo Asahi Shimbun. The the Osaka and Tokyo papers formally merged under a single imprint in 1940. Almost from its inception the newspaper was known for its liberal views. The Asahi Shimbun continues to publish from Osaka today. Osaka Asahi Shimbun, (Osaka) Supplement to Issue no. 18076, May 5, 1932. Very good. Minor wear along original fold lines. Some spotting here and there. Minor ink stain over inset map. Professionally flattened and backed with archival tissue. Harvard University, Hollis 014621967. OCLC 277164143.